This case series proposes to describe the clinical features and laboratory findings associated with fungal infective endocarditis (FIE) encountered in this tertiary care referral centre for cardiology. All cases of FIE, proved by culture of blood or tissue samples for a period of 10 years from June 2007 to June 2017 were included. Retrospective data on patients, whose blood culture grew fungi, mould or yeast, were collected from the medical records section and analysed. A total of 276 cases of IE occurred, in this period and 14 cases (5.07%) of culture-positive FIE occurred. Prosthetic valves (11 cases) were more common than native valves (3). There were eight Candida parapsilosis and all except two were from prosthetic valve which included both metallic (5) and bio-prosthetic valve (1). Other candida spp. included one Candida albicans isolated from bio-prosthetic valve, one Candida haemolunii isolated from bio-prosthetic valve and one Candida pelliculosa isolated from a native aortic valve, detected during surgery for ventricular septal defect closure. There were two mould fungi, namely Wangiella dermatitidis and Aspergillus niger. Out of 14 cases, 10 vegetations were more than 10 mm in size. In 9/14 patients, C-reactive protein (CRP) was greater than100 units when done at admission. One C.parapsilosis was resistant to fluconazole and voriconazole, while another was resistant to fluconazole and amphotericin B. Embolisation to brain and peripheral areas was the most common complication. Surgical excision was successful in three cases, while medical treatment was successful only in one case. Though culture negativity was achieved with drugs, embolisation was the most common cause of death even after culture became negative. In conclusion, FIE is a rare cause of endocarditis. It occurs more commonly in prosthetic valves. Most common aetiological agent in this series was C.parapsilosis. Among prognostic factors, CRP showed a very consistent increase. Surgical excision was curative and embolisation to the brain was the most common cause of death. A multicentre study will be needed to study prognostic factors and risk factors for mortality and to find the best combination of antifungals for treatment. Infective endocarditis (IE) is an infection of the heart valves with an aggregation of bacteria in a fibrin plaque called vegetation. The most common causative agents are the streptococci spp. that are commensals of the oropharyngeal cavity. Fungi, mainly yeast fungi and rarely mould fungi are now emerging as causative agents of the prosthetic valve (PV) IE. IE is treated based on blood culture report, if positive and empirically if negative. This case series describes the clinical features and laboratory findings associated with culture-positive fungal IE (FIE) encountered in this tertiary care referral centre for cardiology. This study was conducted at a tertiary health care centre specialising in cardiology. All cases of FIE for a period of 10 years from June 2007 to June 2017. All culture-proven cases of IE due to yeast fungi or mould fungi. Continuous fungaemia is the hallmark of FIE. A volume of 5 ml of venous blood collected from the patient was added to BacT ALERT 3D (bioMerieux Inc., Durham) FA Plus bottles that contain liquid culture media. This was repeated from another site after 1 h to as per standard protocol. For infants and children, 1 ml blood was collected. At least two samples were taken per day and this was repeated for two or three days. If fungus was isolated from at least two different samples, it was defined as FIE, provided other clinical features as per Dukes criteria are positive including vegetations by echocardiography. This is as per the recommendations given in the article, IE in adults: Diagnosis, Antimicrobial Therapy, and Management of Complications, A Scientific Statement for Healthcare Professionals from the American Heart Association Endorsed by the Infectious Diseases Society of America. 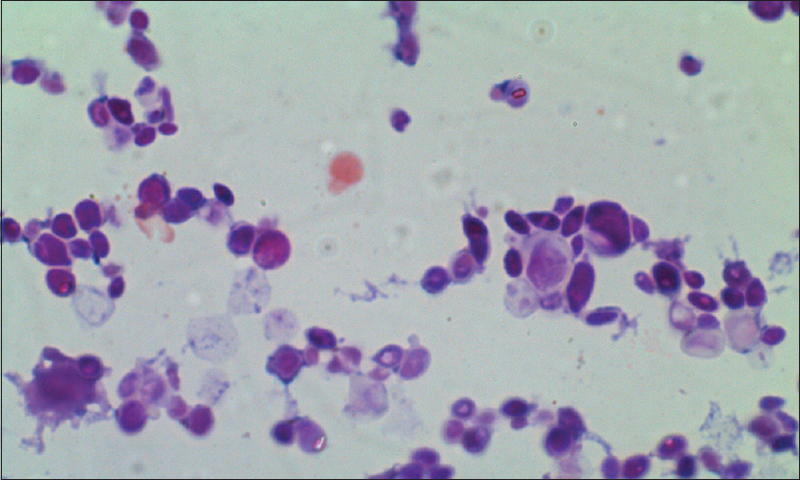 Once growth occurred in the liquid media, gram-stain was done and the fluid was subcultured onto Sabouraud's dextrose agar if yeast or mould fungi were seen by microscopy. Yeast fungi were identified using the YST card of VITEK 2 Compact automated system (bioMerieux Inc., Durham). Sensitivity was done using the card, AST-YS08. Mould fungi were identified by the lactophenol cotton blue mount and observing the morphology by microscopy. One isolate of Wangiella dermatitidis was confirmed by MALDI-TOF at Apollo Hospitals, Hyderabad. All consecutive cases of in-patients with IE due to fungi as proved by growth from blood culture were included. Based on their hospital number, their available clinical data and laboratory findings were recorded on a pro forma, for each patient and entered in excel for easy tabulation. IEC clearance was obtained (SCT/IEC/1116/October 2017dt 7/11/17) for the study without the need for consent. During the 10 years from June 2007 to June 2017, a total of 276 cases of IE occurred and blood cultures were sent for all these cases. Of these, 14 cases (5.07%) of culture-positive FIE occurred. Their age ranged from nine months to 66 years, with an average age of 46.3 years and a median age of 51 years. There were 5 females and 9 males. [Table 1] shows the valves involved, type of valve and surgery done. While there were 11 cases of PVs, there were only three cases of native valves (NVs). Out of 11 cases, endocarditis occurred within one year of the surgery in six cases (29.7%). The mean period to infection after surgery was 3.3 years, with the longest interval being 11 years and the shortest being three months. In one case of the aortic valve, the endocarditis involved a homograft conduit [Table 1]. The 30-day mortality rate after culture positivity was 35.7% and the three months mortality was 42.86%. At admission, C-reactive protein (CRP) was high positive, >100 mg/L when done in a nephelometer in 9/14 patients [Figure 1]. Other raised parameters were erythrocyte sedimentation rate (ESR) and total count. ESR ranged from 8 to 130 mm/h when followed up from admission. Total count was raised mostly in those with complications such as splenic infarct and cranial bleeding/infarct. Haemoglobin was uniformly <10 mg/dl showing one feature of IE, i.e. anaemia. [Table 2] shows the size of vegetation and the fungi grown. Out of the mould fungi, one was Aspergillus niger identified by morphology and one was W. dermatitidis identified by morphology and confirmed by MALDI-TOF. Aspergillus spp. was isolated from valve tissue, whereas wangiella spp. was isolated from blood culture [Figure 2]. Candida species were identified by VITEK2. There were eight Candida parapsilosis and all except two were from PV which included both metallic (five) and bio-PV (one). Other candida spp. 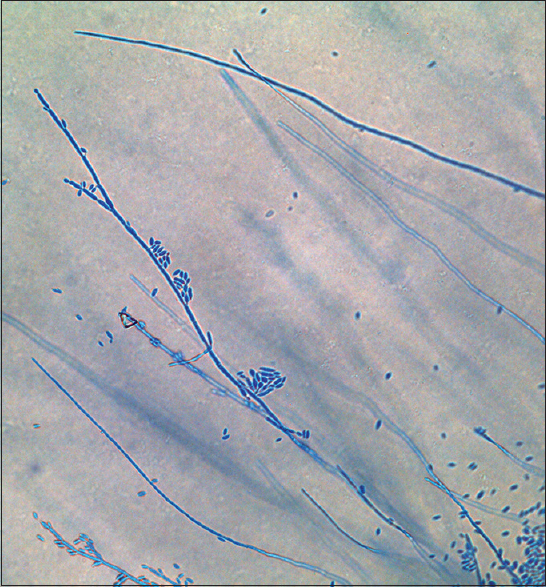 included one Candida albicans isolated from bio-PV, one Candida haemolunii isolated from bio-PV and one Candida pelliculosa isolated from a native aortic valve [Figure 3], detected during surgery for ventricular septal defect (VSD) closure. Sensitivity testing to Fluconazole, Amphotericin B and Voriconazole showed resistance in one isolate each. One C. parapsilosis was resistant to Fluconazole and Voriconazole, whereas another was resistant to Fluconazole and Amphotericin. Out of 14 cases, three were trans-oesophageal, 10 were trans thoracic echocardiography and one vegetation was found at the time of surgery for VSD. Of these, 10 vegetations were >10 mm. Large vegetations were all associated with embolisation and infarcts elsewhere. There was no predilection for a particular valve. [Figure 4] shows fungal vegetation. The massive intracranial bleed was the main feature in three cases. Emboli causing infarcts and stroke occurred in five cases. Vegetations also embolised to other organs such as in three cases of splenic infarct and a case of infarct in the liver, two of whom developed gangrene in the leg also. Aortic root abscess was the sole complication in two patients, one of whom developed aortopulmonary fistula. While on treatment, one patient developed renal failure and another developed central line-associated bloodstream infection (CLABSI). The antifungal agent was chosen based on the culture and sensitivity pattern. The ACC/AHA guidelines for IE, current at the time of hospitalization was taken as reference. Out of 14 cases, Amphotericin alone was given to three, Voriconazole alone to 2 and Fluconazole alone to one. Amphotericin was combined with Fluconazole in five cases and with Voriconazole in three cases. Redo MVR with the replacement of the prosthesis could be done only in one person. In two patients, the removal of vegetation and valve repair was done. In all others, it was not possible to replace the PV due to the large extent of the damage and severe comorbidities conferring prohibitive surgical risk. Poor clinical response to antifungal therapy was one of the main considerations for surgery. Other indications for surgical referral included evidence of extension of infection to peri-valvular tissues, heart failure, systemic embolisation, PV endocarditis (PVE) and large vegetation size. By these criteria, all patients in the series were considered for surgery and evaluated for the same, but all except one had prohibitive surgical risk either due to systemic complications or extensive infection precluding surgical repair. All those whose vegetations were removed, survived. Medical treatment was successful only in one person with PV. Combination of fluconazole and amphotericin was given in this patient for three weeks. However, after being discharged to a local hospital to continue treatment, she succumbed to methicillin-resistant Staphylococcus aureus (MRSA) sepsis. [Table 3] shows all these features of the cases. Many factors can contribute to fungal endocarditis. It is seen to be more common in PVs, compared to NVs. The primary cause for fungal endocarditis is the theatre environment where fungal spores deposit on the open heart during surgery. Of the six SSI, one was A. niger isolated from the homograft valve tissue and not from blood. The causative factor can also be nosocomial. When a patient with PV is admitted in a hospital for some other illness, central lines can introduce fungi into the circulation that eventually cause the vegetation on the PV. In this series, there were three patients with a history of prior admission in another hospital for pneumonia, for staphylococcal sepsis and for childbirth. The rarity of this kind of IE is seen from the fact that only 14 cases were recorded in 10 years. A prospective study was conducted in Italy involving 18 centres over four years. Yeast fungi were isolated in only 13 cases. Regarding diagnosis of fungal endocarditis, diagnosis is initially by clinical features, of which the duration of fever is an important factor. Being subclinical indolent infection, patients tend to be treated symptomatically for long before they are referred to a speciality hospital. All patients presented with fever of long duration spent in approaching different hospitals and investigating for other causes of fever. One patient had a history of fever of six months and the least period of fever was three weeks before approaching this referral centre. Diagnostic markers were analysed for correlation with the different stages of the disease. The blood parameters such as ESR, total leucocyte count and haemoglobin levels were correlated with the progress of the patient and culture positivity. When these parameters are tested at admission, it was seen that CRP showed a more consistent association with FIE than ESR or total leukocyte count [Figure 1]. 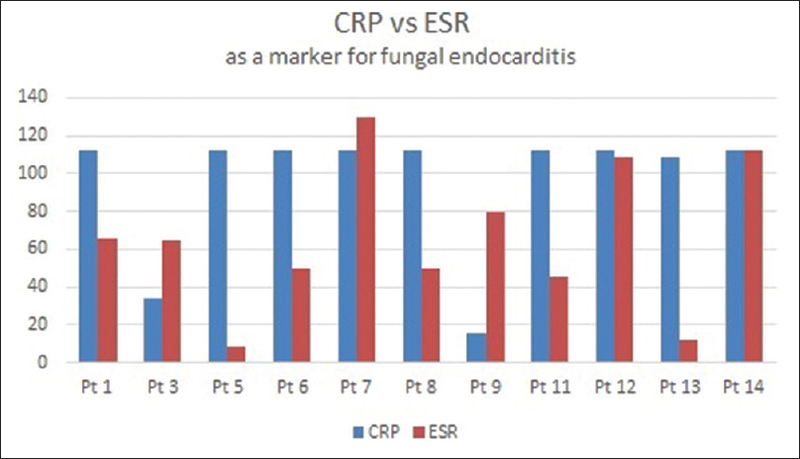 Average ESR was above 100 only in one case of endocarditis, due to the mould fungus W. dermatitidis. Total count remained in the range of 5000–6000 in all patients irrespective of fever or culture positivity. Echocardiography is the mainstay of diagnosis in all forms of IE. Here, the size of the vegetation was generally large and may be a characteristic of fungal endocarditis. Ten out of 14 had a size >10 mm. One of the factors that contribute to a diagnostic challenge is the low culture positivity in fungal endocarditis as compared to bacterial endocarditis. There were only 14 positive cases in 10 years. Yeast fungi grow more readily than mould fungi in the blood culture medium. Only one mould fungus was grown in this series, from blood culture, the other being from valve tissue. In a study in Iran, 11 fungal PVE cases occurred in a two-year period. Aspergillus species predominated with only two of them being due to C. albicans. Out of nine aspergillus species, five were A. niger. The identification of yeast fungi has progressed. Earlier it was cumbersome and could be done only by assimilation tests. The advent of automation has reduced this burden and all yeasts except the one isolated in 2007, were accurately identified by VITEK 2 YST card. The most common Candida species to cause IE is C. parapsilosis in this series. Other candida were C. albicans, C. haemolunii and C. pelliculosa. In the study at Mayo Clinic, Candida was not speciated, but it was the most common followed by a rare fungus, Histoplasma capsulatum. Other studies, like the one in Italy and another done in China report C. albicans as the most common fungus to cause IE., For mould fungi, the classical method of morphological identification is still followed. Of late, MALDI-TOF has emerged as a good tool for identifying mould fungi. After morphological identification, the W. dermatitidis could be confirmed by MALDI-TOF. Among the prognostic markers fever is an important feature and a proper temperature chart is the crux of management of IE. In 10 patients out of 14, fever came down to normal in the week following culture negativity or removal of vegetation. In the case of one patient with W. dermatitidis endocarditis, fever touched normal only with a combination of parenteral amphotericin and voriconazole but recurred when he developed a thrombus in the brain in the sixth week. Fever also occurs if a patient develops CLABSI due to the continuous IV drugs being administered. This has to be differentiated from lack of response to the anti-fungals. 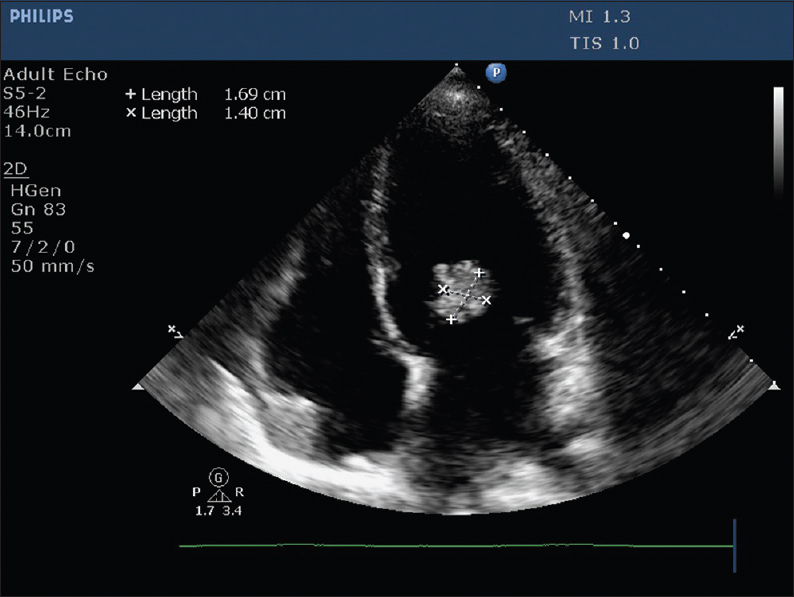 Unlike bacterial endocarditis, fungal endocarditis ends up in more complications. Complications associated with fungaemia (not related to treatment like renal failure) were mainly thrombo-embolization and bleeds in major organs such as the brain, spleen, kidney and one case of infarct in the liver. At admission, five patients out of 14 already had complications that included infarcts in spleen, liver and kidney and two had intracranial bleeds. Two patients had aortic root abscess and aortopulmonary fistula at admission. Following the progress of the patients, intracranial infarct/bleed was the complication that occurred from the second week onwards. No splenic infarct occurred later in the course of the disease. Emboli causing gangrene in the limbs occurred only after the third week in all three patients who developed it. However, the size did not correlate with the propensity for embolisation in different organs. Even the smallest one with size of only 5 mm caused clots in the popliteal artery and in the brain. With regard to embolisation, one point noted was that no embolisation occurred from both the NV endocarditis (NVE) cases where the complication was mainly aortic root abscess. The third NV was a case of mitral valve repair, where embolisation to brain occurred. Both mould and yeast fungi caused embolisation. In the case of PVE due to W. dermatitidis, surgery was difficult to perform and the patient was managed with anti-fungals. Although the fungaemia subsided by the fourth week of Voriconazole and Amphotericin and patient became clinically better, he succumbed to a fatal intracranial bleed towards the end of the seventh week of treatment. A rare case was that of a child with PDA and VSD who had vegetation on the aortic valve detected during the open heart surgery done for the congenital disabilities. She was asymptomatic at admission and the surgery was a planned one. The tissue yielded C. pelliculosa; however, since blood was not sent for culture before the surgery, there was no blood isolate of the fungus. Her CRP was high at admission and rose to 105 mm/h later. She was treated with amphotericin and voriconazole. Treatment of fungal endocarditis involves both medical and surgical. In our series, one candida isolate each was resistant to amphotericin, fluconazole and voriconazole. Treatment was mostly a combination of either fluconazole and amphotericin or voriconazole and amphotericin. Liposomal Amphotericin is costlier, but taking into consideration the potential for renal failure with the plain form, it was given as far as possible. In three cases growth occurred in spite of treatment and the patients died. In one case, patient died before treatment could be initiated. Fluconazole alone was given in one case and amphotericin alone in another. In the third case, a combination of fluconazole and amphotericin were given. Surgical excision of the valve and vegetation could be done only in three patients, of which one was an NV. All three survived. For fungal endocarditis especially on the PV, surgical excision seems to be the best option as seen in this series. Other surgical interventions included embolectomy on embolus leg and a saddle embolus on the aorta, but both patients died. Combination of voriconazole and amphotericin was given for three cases. In all three, cultures became sterile and one of these was discharged. However, she continued treatment outside and came back with MRSA sepsis to which she succumbed. Voriconazole and amphotericin successfully eliminated W. dermatitidis from blood, though patient died of intracranial bleeding. Hence, this appears to be a better combination than fluconazole and amphotericin. In a review article on the treatment of IE, the authors conclude that a combination of surgical and medical treatment is needed. They further find that caspofungin is a good drug for combining with both amphotericin and fluconazole. Caspofungin was not used for treatment in any of these patients. In the past 10 years, there were 14 cases of culture positive FIE in this super specialty centre for cardiology, which shows that these are rare causes of IE. A majority were in patients with a PV. Blood parameters that were checked at admission were CRP, total leucocyte count and ESR. Of these, CRP was the only one that was consistently high, i.e., above 100 units. Embolisation of vegetation was the most common complication that occurred even after successful eradication of the fungus from the blood. Organs involved included spleen, limbs, liver and brain. Intracranial infarcts and bleeding were the most common causes of death. In the case of NVE, embolization was rare and abscess in the valve was more common. The most common cause was C. parapsilosis which was isolated from 8 out of 14 cases. Two mould fungi were isolated, one from blood culture and other from valve tissue after excision. W. dermatitidis could be confirmed by MALDI-TOF after morphological identification. Sensitivity to antifungals is maintained, however, though the cultures become negative on treatment with a combination of voriconazole/fluconazole with amphotericin, intracranial infarcts lead to death. Due to the paucity of cases at a single centre, a multicentre study will be needed to study prognostic factors, risk factors for mortality and to find the best combination of antifungals for treatment. Baddour LM, Wilson WR, Bayer AS, Fowler VG Jr, Tleyjeh IM, Rybak MJ, et al. Infective endocarditis in adults: Diagnosis, Antimicrobial therapy, and management of complications, a scientific statement for healthcare professionals from the american heart Association. Circulation 2015;132:1435-86. Falcone M, Barzaghi N, Carosi G, Grossi P, Minoli L, Ravasio V, et al. Candida infective endocarditis: Report of 15 cases from a prospective multicenter study. Medicine (Baltimore) 2009;88:160-8. Badiee P, Amirghofran AA, Ghazi Nour M, Shafa M, Nemati MH. Incidence and outcome of documented fungal endocarditis. Int Cardiovasc Res J 2014;8:152-5. Boland JM, Chung HH, Robberts FJ, Wilson WR, Steckelberg JM, Baddour LM, et al. Fungal prosthetic valve endocarditis: Mayo clinic experience with a clinicopathological analysis. Mycoses 2011;54:354-60. Sun XL, Zhang J, Wang GG, Zhuang XF, Yang YM, Zhu J, et al. Comparison of characteristics and short-term outcome from fungal infective endocarditis in prosthetic valve endocarditis versus native valve endocarditis. Am J Cardiol 2013;112:111-6. Yuan SM. Review article on fungal endocarditis. Braz J Cardiovasc Surg 2016;31:252-5.